The topic ‘Community Management‘ has gained popularity ever since social media claimed a major stake of our professional lives – both online and offline. Before social media, the activity was mostly the same, only the scope and the channels have changed: remember the “User Groups”, “Forums” and other similar initiatives that have always been at the heart of any business initiative that need to interact with the stakeholders. The core of this dynamic is CONTACTING the people that surround the organization, SHARING with them the value and getting them to a point of ENGAGEMENT. It is only at this final stage can you really speak about a community and the “management” of it. This aspect is true even if the term is too much in one direction (“1-to-many” and top-down) and does not reflect the real power of a community (that enables “many-to-many”, and bottom-up interactions). From the early months of the project, we’ve been mapping the European IoT ecosystem and adding relevant emails of potential community members. Then we’ve contacted them and asked them to join if they want (must be an opt-in model to comply). Having a dense and widely spread exposure is great, but how do you create a community out of this? And before the exposure has its critical mass, how can sharing content and values help in creating the community? We believe, showing your added value by sharing useful information to the defined target audience, is required in order to create a bond, a collaboration and in the end a close community. IoT-EPI consists of 7 Innovation Projects, each of them having their own community. The projects are addressing a similar challenge: creation of an interoperable and secure ecosystem of established and emerging IoT solutions. This naturally creates a competitive climate between the involved projects. We focused strongly on evolving this competitiveness towards a Coopetitive alliance as coopetition leads to mutually beneficial results – creating a win-win situation (Coopetition is essentially collaboration among competing parties). An example of this includes the alignment of all 7 innovation projects to use a common open calls platform. All the projects used open calls as an instrument to attract startups & SME’s to join their eco-system along with funding prospects. A common open call application submission & management platform had several benefits for the projects. Couple of them included – the knowledge exchange on what worked and what did not work, access to a common pool of startups / SME’s under IoT-EPI (e.g. startups that were not successful at one open call of a project were able to easily find and apply for another open call of a different project within IoT-EPI). The uptake of the solutions proposed by the innovation projects is crucial for their long-term sustainability. For this to happen, a certain level of co-creation with potential contributors/users of the solutions offered by the projects is needed. IoT-EPI stimulated this kind of exchange via the coordination and presence at exhibitions, conferences and meetups. These kind of activities are a great opportunity to meet face-to-face with developers, startups, and other stakeholders and exchange market knowledge and test their product hypotheses. Own Events: Meetups, Ideation Challenges, etc. In our experience, partnering up with a local non-competitive organization that organizes an event with the same target audience ( (e.g. co-hosting) is a great way to gain access to new communities. As opposed to larger events, we also learned that meetups are an excellent platform for more effective targeting and proved a strong medium to inspire and share experiences. Focusing on use cases makes the presentation more digestible and dynamic – and essentially easier for the audience to identify their works with the objective of the innovation projects. Communication activities in parallel plays a crucial role in tying all the outreach activities together constantly staying in touch with the community. We followed a multi-channel approach to stay connected with our community: social media channels (Twitter, Facebook & Linkedin), Regular Newsletters and a Website as our content hub. The transition of stakeholders from bystander to “co-creator” and at the end “ambassador” is a major driver for community building of the Innovation Projects. The engagement activities, in our context, primarily took the shape of Open Calls or Challenges such as Hackathons and Ideation Competitions. Besides attracting relevant parties towards the IoT-platform technologies, the open calls of the projects provide a good channel to convert them in real users. The given support and the interaction before, during and after the integration is crucial to assure a solid uptake. A major pre-requisite here is that grant recipients of the open call implement or connect to the solutions of the projects and provide good use cases – essentially advancing the solutions offered by the projects. However, it is important for the projects not to forget the ones that did not get selected. This pool of applicants that showed interest in cooperating with one particular project may be a valuable candidate for another open call. Using common platforms like F6s makes this exchange possible. Finally, Hackathons and Idea Challenges are great ways to offer the technology solution or the solution concept and have developers or entrepreneurs start using the proposed solutions early on. Hackathons provide very valuable and very direct feedback to the Innovation projects and are effective channels to find potential collaboration partners. 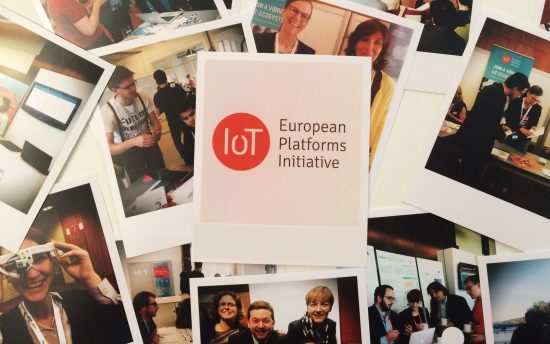 The IoT-European Platforms Initiative (IoT-EPI) was formed to build a vibrant and sustainable IoT-ecosystem in Europe, maximising the opportunities for platform development, interoperability and information sharing. At the core of the program are seven research and innovation projects: Inter-IoT, BIG IoT, AGILE, SymbIoTe, TagItSmart!, Vicinity and bIoTope. With a total funding of EUR 50 million and a partner network of 120 established organizations, these projects develop innovative IoT platform technologies. Furthermore, they also foster technology adoption through community and business building activities. Most projects run within the time-frame of 2016 – 2018 – with some extending until 2019. In 12 open calls, more than 100 IoT-projects will get technology support and funding in the amount of EUR 30,000 to EUR 150,000 each.